When you walk around an art gallery I wonder how long you spend in front of each painting. 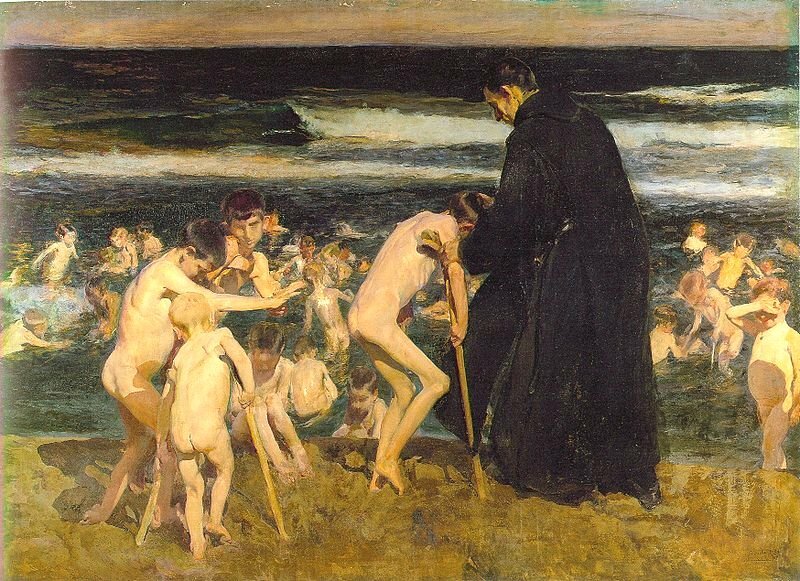 I suppose it depends on the type of painting and whether it is part of a crowded special exhibition when you are jostled from one painting to the next by a crowded sea of viewers. I suppose it also depends on your time management as if you are coming to the end of your allotted time you tend to jump from one picture to the next in a desperate attempt to not miss a single one, although in a way your hurried state probably means that the last few painting remain just a blur in your mind. 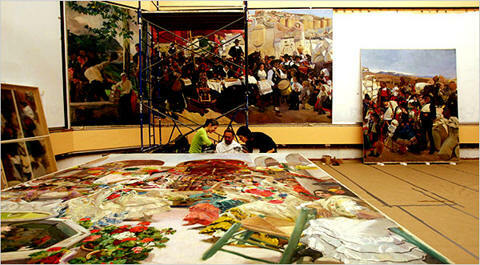 So why do I ask this question about time management and carefully appreciating the paintings before us? 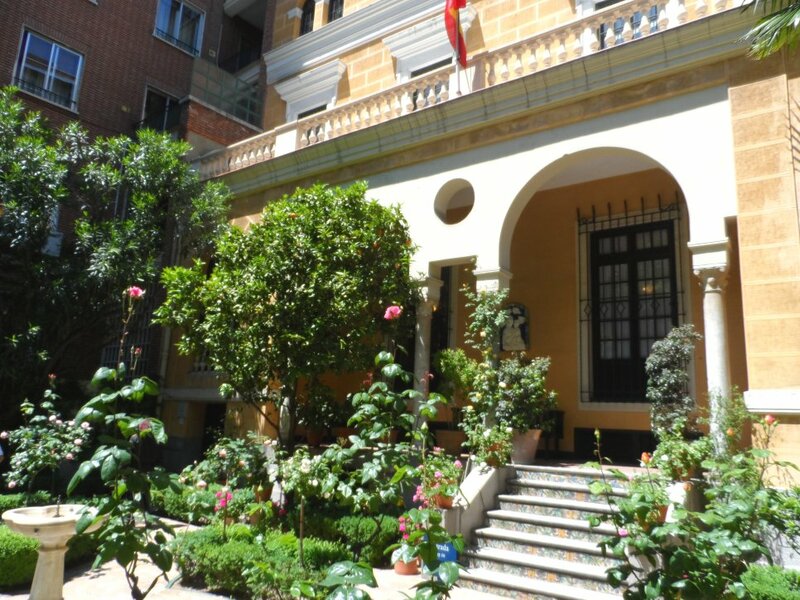 The answer is that during a recent visit to the Thyssen-Bornemisza Museum in Madrid I had left the room, which housed the fifteenth century art collection till last and I was constantly aware that my time at the museum was running out. 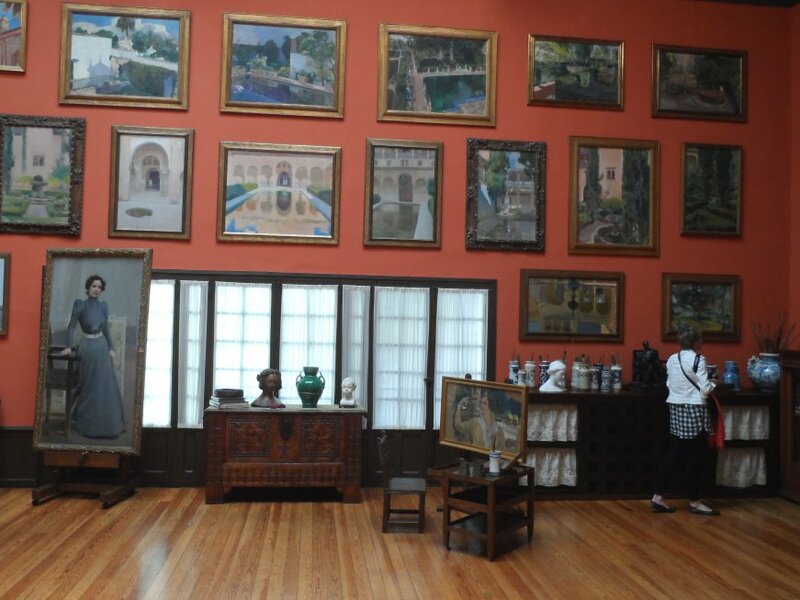 I found myself flitting from one painting to another and I have to admit by doing so I failed to take in the beauty of the works in that section of the gallery. That was until I came across two stunning works which I could hardly drag myself away from. They were just such beautiful paintings. Yes, I know beauty is in the eye of the beholder but for me they were truly exquisite. I stood before them, totally mesmerised by their intrinsic charm and so I am dedicating my next two blogs to those two 15th century works. Today I want to offer you a beautifully crafted portrait by the 15th century Italian artist Domenico Ghirlandaio entitled Portrait of Giovanna degli Albizzi Tornabuoni which he completed in 1490 and which is now part of the permanent collection at Madrid’s Thyssen-Bornemisza Museum. 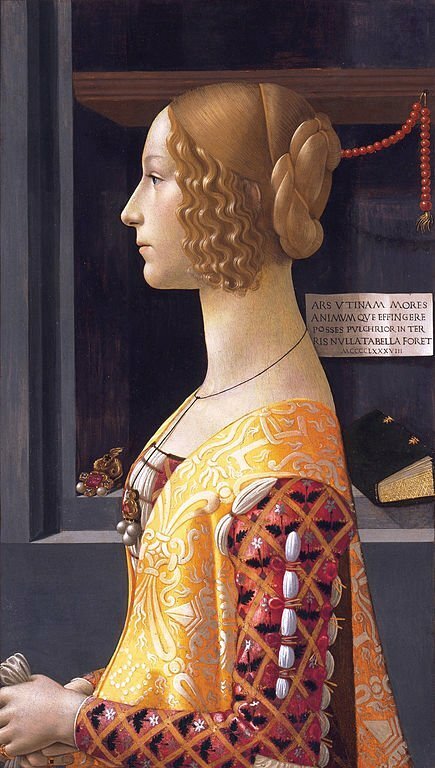 Giovanna was the wife of Lorenzo Tornabuoni who came from the wealthy Florentine banking family and whose father, Giovanni was Domenico Ghirlandaio’s patron. 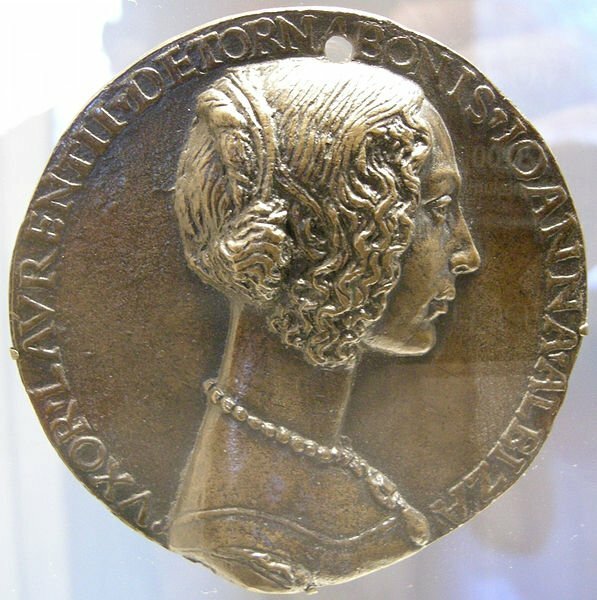 We know this is the image of Giovanna as at the time of her marriage to Lorenzo a series of bronze portrait medals with her image were made to commemorate the event and the likeness of the figure on the medal and in the painting is undeniable. Lorenzo and Giovanna married in June 1486 but sadly she died giving birth to her second son in 1488, at just twenty years of age. 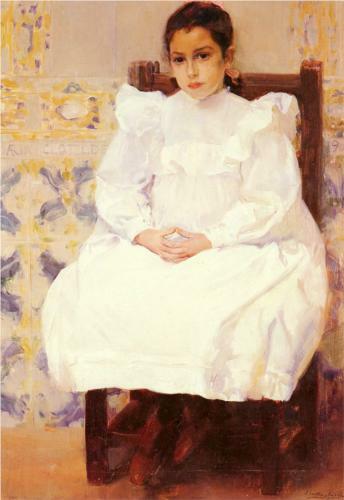 As the portrait was completed after she died, it is thought that it could be looked upon as a kind of remembrance painting. 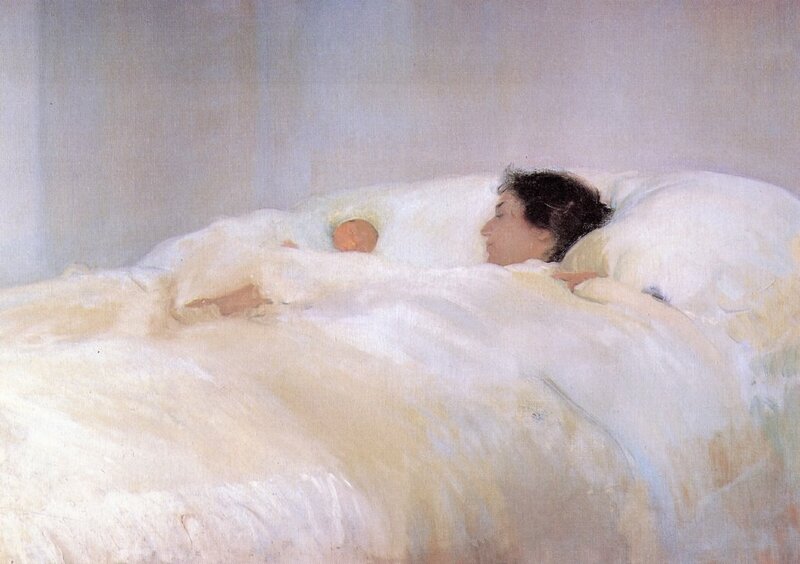 The painting hung in her husband’s private rooms in the Tornabuoni Palace. We see Giovanna before us, half-length, in a somewhat rigid profile. In her hands she clasps a handkerchief. Giovanna is dressed in the most sumptuous way. She wears a giornea which is an open-sided over-gown, which is brocaded. The design on the brocade features the letter “L” and a diamond. The “L” is her husband, Lorenzo’s initial and the diamond was the Tornabuoni family emblem. There is no doubt that she is one of Florence’s élite by the way she wears her hair in the very latest Florentine fashion. The jewels she wears around her neck comprise of two rings and pendant which were given to her by Lorenzo’s family as a wedding gift. If you look closely at the pendant she wears you will also notice a matching brooch designed in the shape of a dragon which lies on a shelf behind her. The jewel with its dragon, two pearls and a ruby formed a set with the pendant hanging from a silk cord around her neck. Behind her, on the shelf, is a prayer book which is thought to be the libriccino da donna (little ladies’ book). Above the book hangs a string of coral beads which have been identified as a rosary. Ghirlandaio’s inclusion of this prayer book and the rosary in the painting was testament to Giovanna’s religious beliefs and her piety. 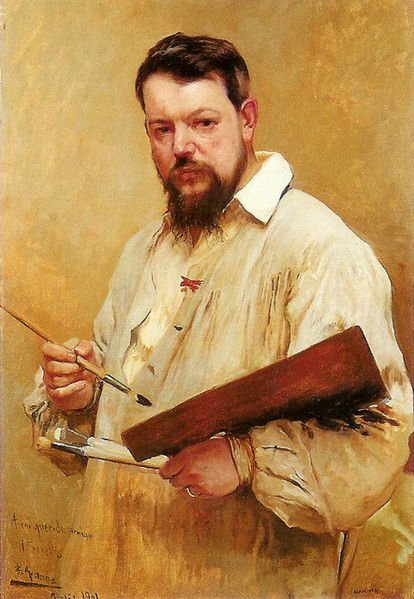 “…Would that you, Art, could portray her character and spirit ; for then there would be no fairer painting in the world..”. By these words there is no doubt Ghirlandaio is excusing himself to Giovanna for his belief that he has not been able to show her real inner beauty. These are fine words from our artist but in fact they were not quite his own as they are a slight variation on the words of an epigram (a short and concise poem) of the Latin poet Marcus Galerius Martial, whose works were all the rage with the Florentine aristocracy of the day. 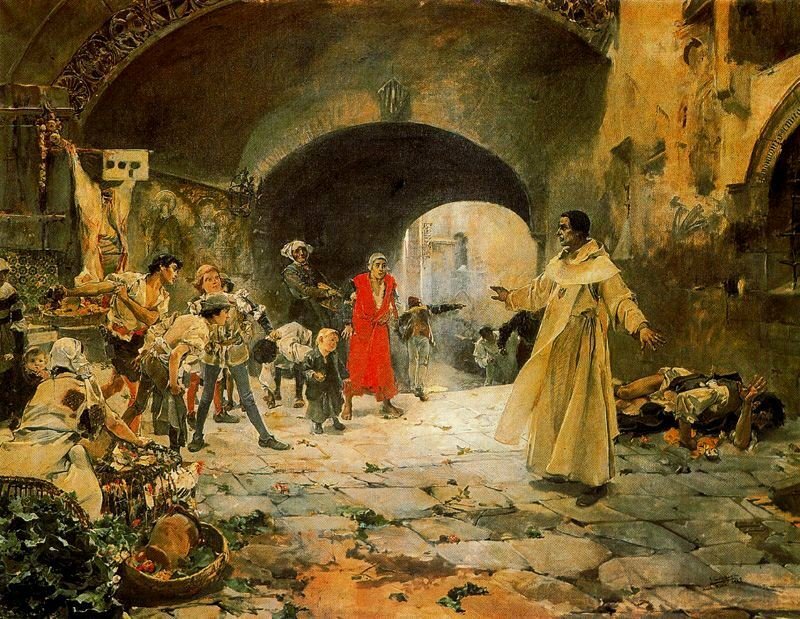 My featured artist today was born Domenico di Tommaso Curradi di Doffo Bigordi. The name was derived in part from his father’s surname Curadi and the surname of his grandfather Bigordi. He was born in Florence in 1449, the eldest child of Tommaso Bigordi and Antonia di ser Paolo Paoli. His father was a goldsmith and was well-known for creating metallic garland-like necklaces which were worn by the ladies of Florence, and it was for that reason that Domenico was given the nickname Il Ghirlandaio (garland-maker). 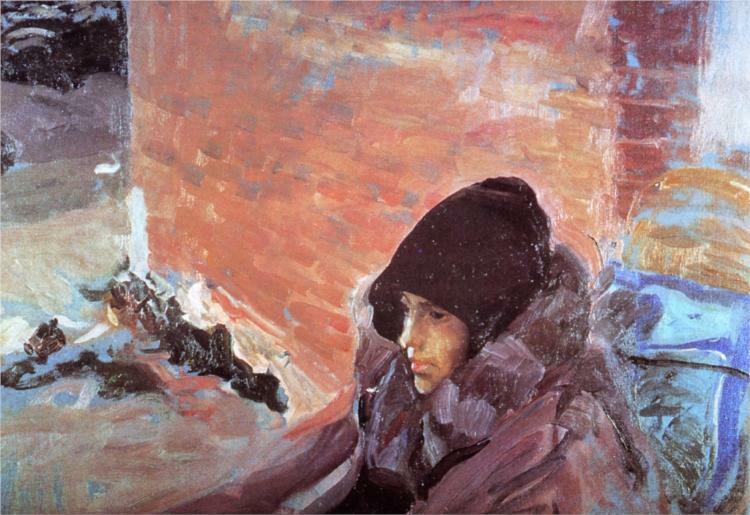 Domenico worked in his father’s jewellery shop and it was during his time there that he started sketching portraits of customers and passers-by. According to the famous biographer of artists, Giorgio Vasari, Domenico’s father decided to afford his son some formal artistic training and had him apprenticed to the Florentine painters, Alesso Baldovinetti and later Andrea del Verrocchio. Domenico will always be remembered for his exquisite detailed narrative frescos in which he would incorporate portraits of the local aristocracy resplendent in their finery. Many of his frescos appeared in local Florentine churches. In 1482, he also completed a Vatican commission for Pope Sixtus IV – a fresco in the Sistine Chapel entitled Calling of the First Apostles. The frescos he will probably be best remembered for were two major fresco cycles, which he completed with the help of his brothers, Davide and Benedetto along with his brother-in-law, Bastiano Mainardi, who was one of Domenico’s pupils. The first of these frescos was for the Sassetti Chapel in the church of St Trinita in Florence. 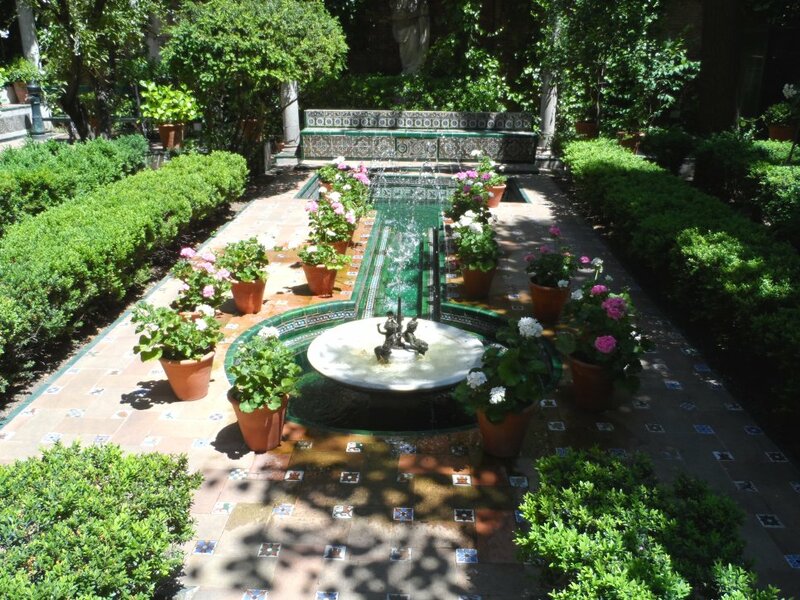 It had been commissioned by Francesco Sassetti, a rich and powerful banker who worked for the Medici family. This cycle of frescos was in six parts and depicted the life and times of St. Francis of Assisi, who was Sassetti’s patron saint. Seen within the frescos were a number of portraits of members of the Sassetti family along with some of the leading figures from the Medici family. To look at the two families within the frescos one would be forgiven for coming to the conclusion that the Sassettis and the Medicis were very close, which of course was precisely the allusion Francesco Sassetti had wished to convey. Alas for him, the close bond between the two families was all in his mind! Ghirlandaio had not even completed the Sassetti fresco cycle when he was given this second large scale commission and he had to bring in most of the workers from his large Florentine studio to help him in this four-year project which was finally completed in 1490. 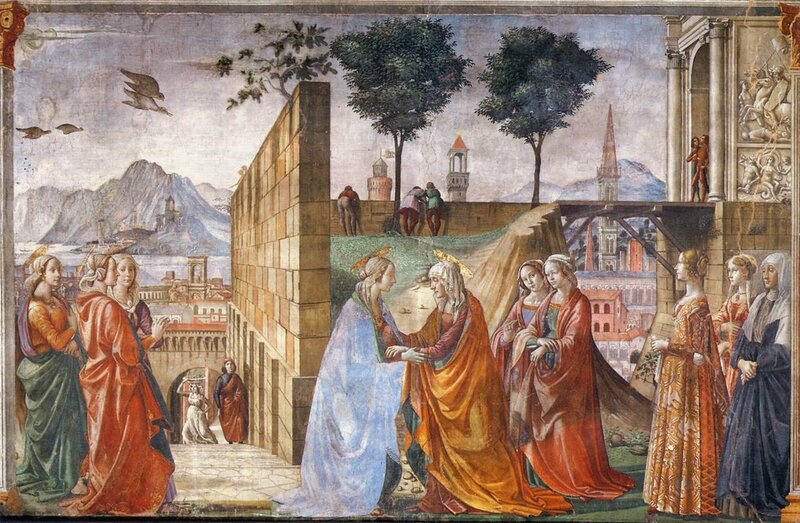 The reason for talking about this fresco cycle is that I want you look closely at Ghirlandaio’s fresco, the part entitled Visitation. Look at the third woman from the right. Do you recognise her? It is a full length portrait of Giovanna Tornabuoni who was the wife of Lorenzo Tornabuoni whose father, Giovanni was the commissioner of the fresco work and who was also my subject of today’s featured work. 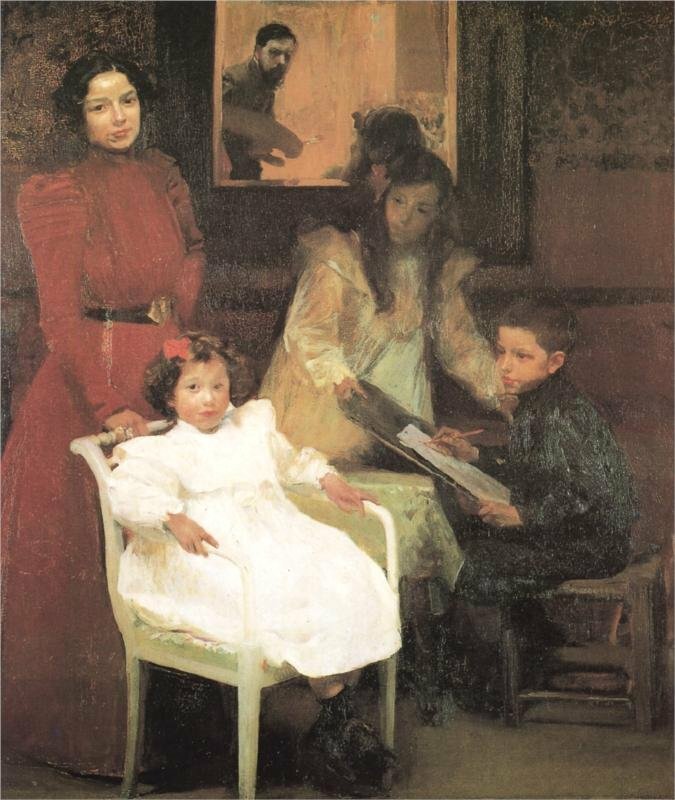 The painting had a number of owners but in 1907 the American millionaire financier and philanthropist and founder of the J.P. Morgan bank, J. Pierpont Morgan bought it in 1907. It is believed that he adored the painting as it reminded him of his first wife, Amelia Sturgis, who like Giovanna had died very young. 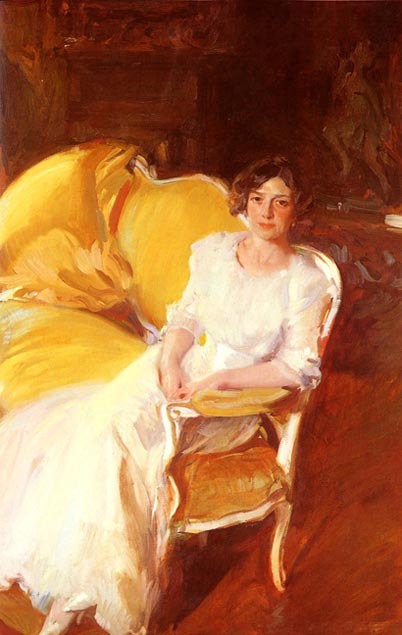 She died of tuberculosis at the age of twenty-six, just four months after she and J.P. had married. It entered the Thyssen-Bornemisza collection from the Morgan Library, New York, in 1935. 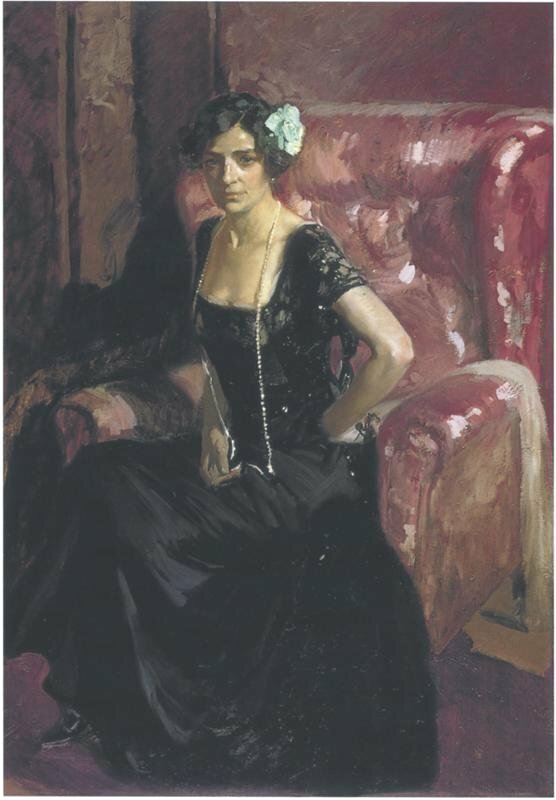 Whereas J.P. Morgan had his painting on view in his home to remind him of his wife I have a print of it on my breakfast room wall to remind me of Giovanna’s beauty as I serve guests with their breakfasts. My Daily Art Display today continues examining the life of the seventeenth century Flemish painter Jan Siberechts and taking a look at some of the paintings he completed after he moved his home to England. 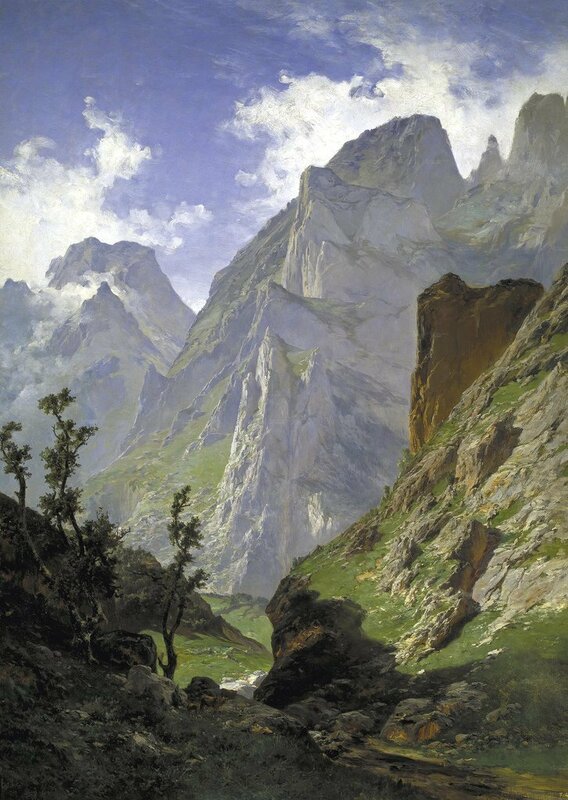 In my previous blog I talked about Siberechts’ early landscape paintings which followed the style of the Dutch Italianate artists of the time. Then, in the early 1660’s, he worked on a number of paintings depicting Flemish rural life and the life of the peasant community. In 1672, at the age of forty-five, Siberechts’ life changed. Two years earlier, George Villiers, the second Duke of Buckingham, whilst on business in the southern Netherlands came across some of Siberechts’ work. He was so enamoured by what he saw that he invited the artist to come to England and help decorate his Italianate mansion, Cliveden, which was situated on the bank River Thames near the town of Windsor and which he had built six years earlier. Jan Siberechts agreed to move home to England and became just one of the hundreds of Dutch and Flemish artists who came to Britain in the seventeenth century to ply their trade. Siberechts’ work at Cliveden enhanced his reputation in England as a talented artist and his birds-eye views of stately homes became much sought after. His recognised artistic ability and his connection with Villiers, led him to be awarded numerous painting commissions from the aristocracy and he was often referred to as being the “father of British landscape painting. These aristocratic commissions from around England were often for paintings of their stately homes. 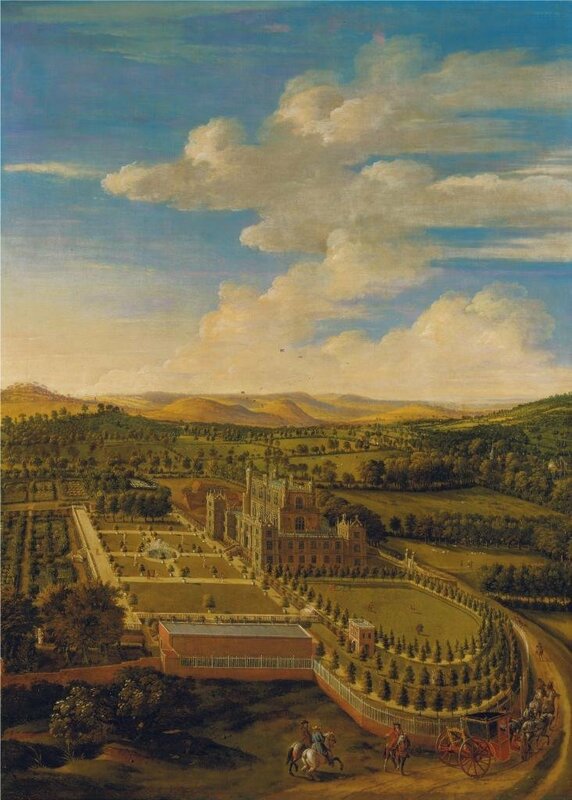 One such example was his 1695 work entitled Wollaton Hall and Park which was in Nottinghamshire and the home of Thomas Willoughby, 1st Baron Middleton. Another commission in 1694 was for a painting of Chatsworth, the Derbyshire country house of William Cavendish, the 1st Duke of Devonshire. Siberechts received a commission in 1675 from Thomas Thynne. 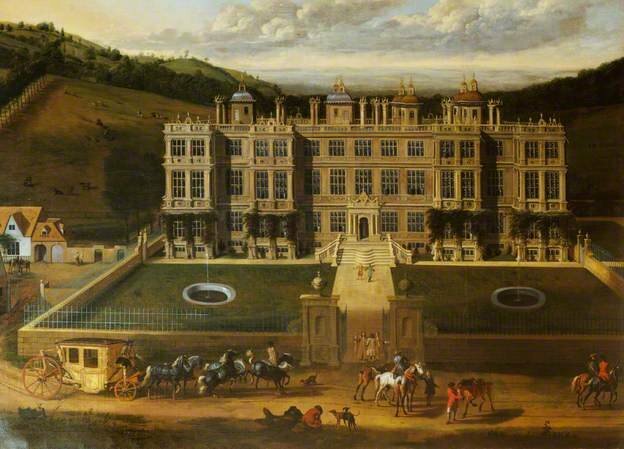 The painting, entitled View of Longleat, depicted his stately home. The work still hangs in the house. Three years later Siberechts completed another painting of the building and this is now part of the Government Art Collection. These depictions of country houses and country estates were very popular with their aristocratic owners and Siberechts was inundated with similar commissions. 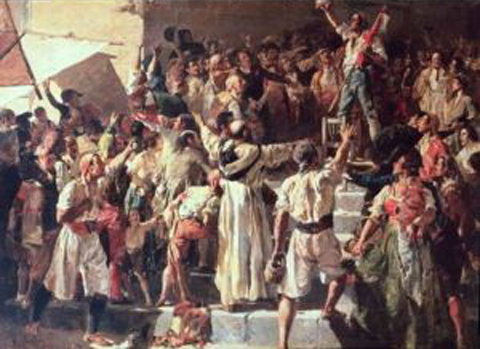 In the foreground of this painting we see the aristocratic owners along with their horses, portrayed as huntsmen readying themselves for the hunt. 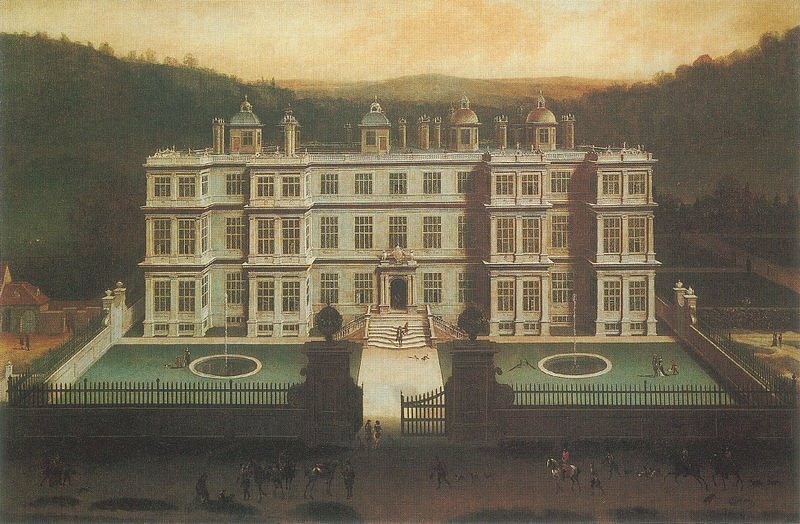 Another example of this type of work by Jan Siberechts is his 1696 topographical landscape painting entitled View of a House and its Estate in Belsize, Middlesex which he completed in 1696. In the painting we see a birds-eye view of the The Grove, the house and estate of Sir Francis Pemberton, a leading figure of the English judiciary. He, along with his wife and seven children, lived there until his death in 1697 just one year after Siberechts had completed the work. Pemberton had bought the neighbouring Dorchester House and its estate around 1688. He then demolished that house to make way for his extensive vegetable gardens and orchards. The all-embracing gardens can be seen surrounding the manor house in Siberechts’ painting. Jan Siberechts spent a good deal of time travelling around the English countryside fulfilling commissions to paint palatial residences. 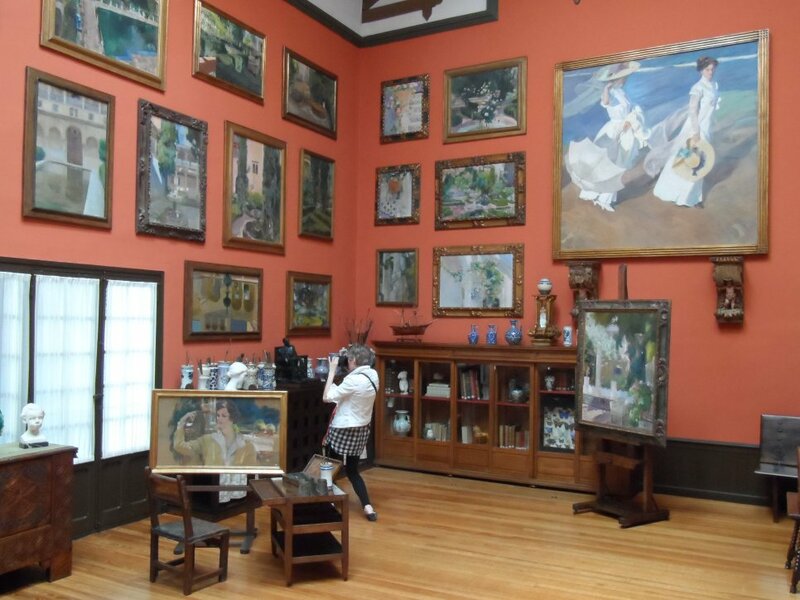 Such paintings were interspersed with works featuring hunting scenes and views of the rural landscape. 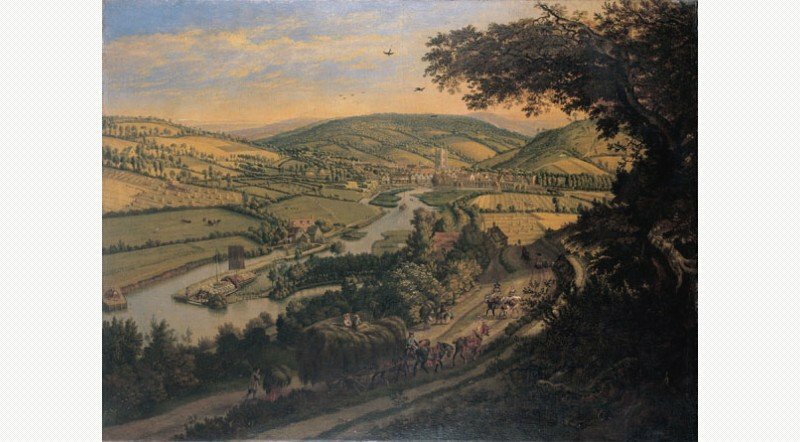 My last offerings today are also from the 1690’s when Siberechts completed a series of five landscape paintings featuring the town of Henley and the Thames Valley. There is no record of who commissioned the works but it could well have been one of the many rich merchants who owned land around the town of Henley. The works were different to his earlier ones featuring stately homes for in this series Siberechts concentrated on the landscape of the area with its pastureland and woods and also included views of the River Thames and the boats which plied their trade along this busy waterway. 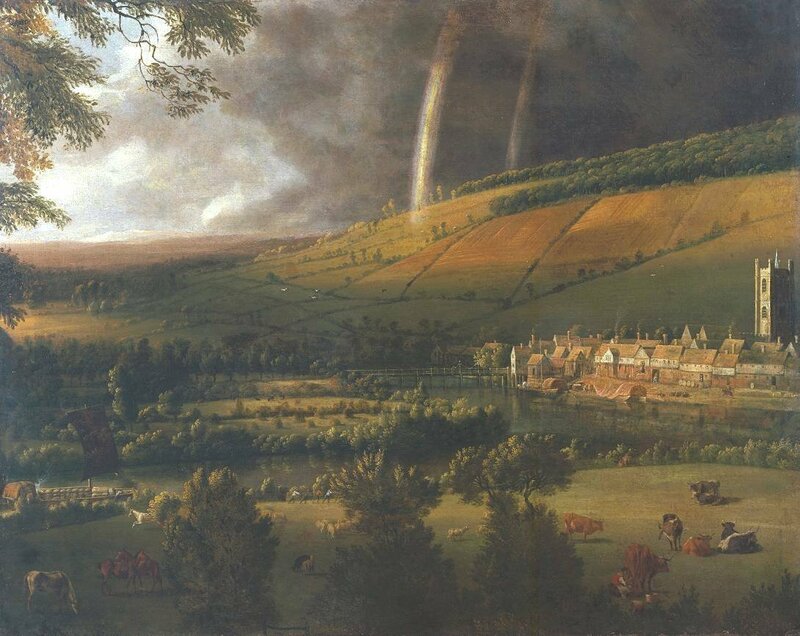 One of the best known of these, entitled Landscape with Rainbow, Henley-on-Thames, can be seen at Tate Britain. It is a beautifully crafted painting. In the foreground we have cattle and horses grazing in pastureland which slopes down towards the tree-lined banks of the River Thames. On the left we can see a laden barge, piled high on deck with its cargo, being manoeuvred along the waterway by four men in the field, who laboriously drag the floating hulk towards the warehouses of Henley. To the right of the painting we see the busy little town of Henley-on-Thames with its high-towered 13th century church, St Mary the Virgin, rising amidst the dwelling places. The church still stands today. The background to the right is filled with rising hills, more pastureland and the occasional woods above which are a double rainbow and a dark and threatening rain cloud which is emptying its contents on the fields below. In the left background of the painting the view has opened up more and we catch a glimpse of the distant hills. Another painting in the series was Siberechts 1698 work entitled Henley from the Wargrave Road which hangs in its own room in the Henley Gallery of the River & Rowing Museum, Mill Meadows in Oxfordshire. This work is a veritable masterpiece which is in a way a historical record of the time depicting the life of the town, its surrounding countryside, and the importance of the commercial trade using the river. Siberechts has depicted the 17th century buildings of Henley with its old wooden bridge with stone flood arches, the Church and the mill on the river. In the foreground we can see farm workers busy haymaking in the riverside meadows and a cart fully loaded with hay heading down the country lane towards the town of Henley. It is interesting to look back at the paintings of Jan Siberechts which I have featured in my last two blogs. They are so different. There is a certain simplicity and charm to his 1660’s rural life works but his artistic talent cannot be denied when we study some of his later works which he completed during his days in England. Jan Siberechts died in London in 1703, aged 76. My Daily Art Display today features the 17th century Flemish painter, Jan Siberechts. 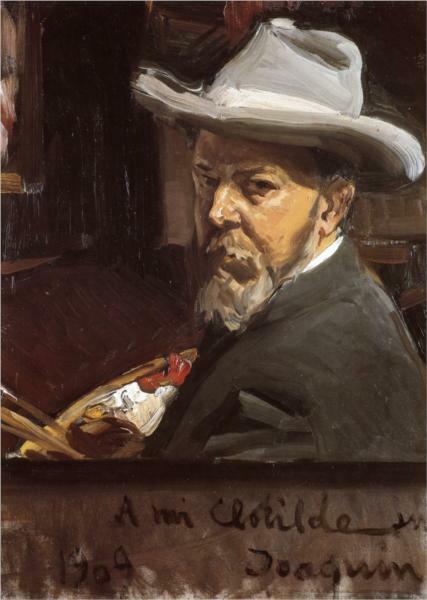 I will also look at some of Siberechts works and look how his style of painting changed during his lifetime. In today’s blog I will concentrate on his rural life paintings and in my next blog I will look at how his painting style changed when he went to England. Jan Siberechts was born into a family of artists in Antwerp in January 1627, first training with his father, who was a sculptor. Little is known of his early life and upbringing except to say that in 1648, at the age of twenty-one, he became a master in the Guild of St Luke in Antwerp and four years later, in 1652, he married. Siberechts’ early works, up until around 1660, were mainly landscapes which were heavily influenced by the Dutch Italianates. The Dutch Italianates were a group of seventeenth-century Dutch artists who painted landscapes of Italy. 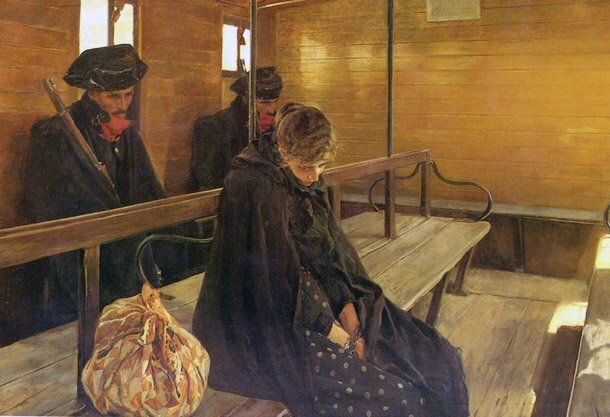 Many of these painters had travelled to and lived in Italy whilst others who had never made the journey to Italy were simply stimulated by the works of those who did. 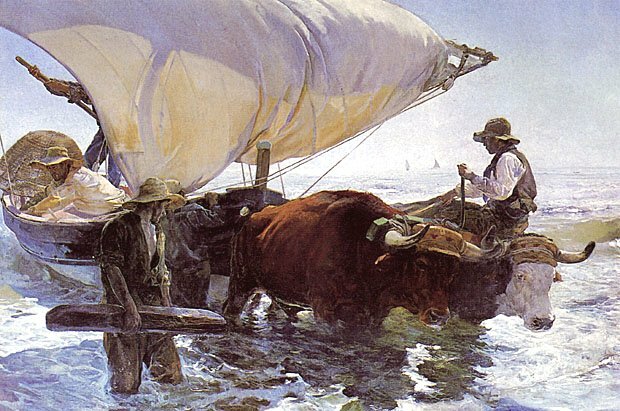 Many young Dutch painters made the arduous journey, often by foot, over the Alps to Italy, whereas others travelled by sea. The favourite destination for these intrepid travellers was usually Rome, but some journeyed to Venice, and a few to Genoa. Many of these artists would make copious sketches during their sojourn in Italy and in the case of those who crossed the Alps on foot, they would pictorially record their arduous journey through the breathtaking mountain passes and then, once they arrived back home to their studios, they would produce this Italianate art. Such works of art, which were extremely popular with the Dutch and were in great demand in what was then a booming Dutch art market. These Dutch Italianate painters enthused over the golden light of Mediterranean skies which they encountered in Italy. The countryside around Rome (campagna) was a constant source of inspiration and featured in many of the works of the Dutch Italianates. Some of the leading Dutch Italianate painters during the lifetime of Siberechts were artists, such as Nicolaes Berchem, Jan Both, Karel du Jardin, and Jan Weenix. Because Siberechts’ early works reveal the influence of the Dutch Italianates some art historians believe that he may have made the journey to Italy but there is no firm proof of this assertion. Many believe Siberechts remained in Antwerp until 1672 at which time he accepted an invitation to travel to England and so it could be that he was simply influenced by the finished works of the Dutch Italianate painters which were offered up for sale in Antwerp. 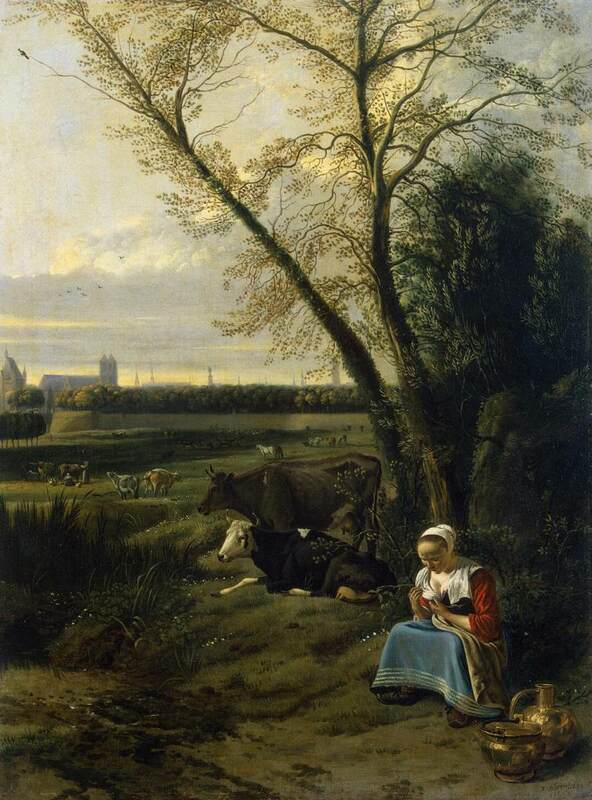 Siberechts style changed around 1661 when he became interested in depicting scenes from the Flemish countryside and the rustic life of the peasants. His initial landscape work with its occasional small figures changed and, in his work now, the figures in his landscape settings were larger and took on a paramount importance. 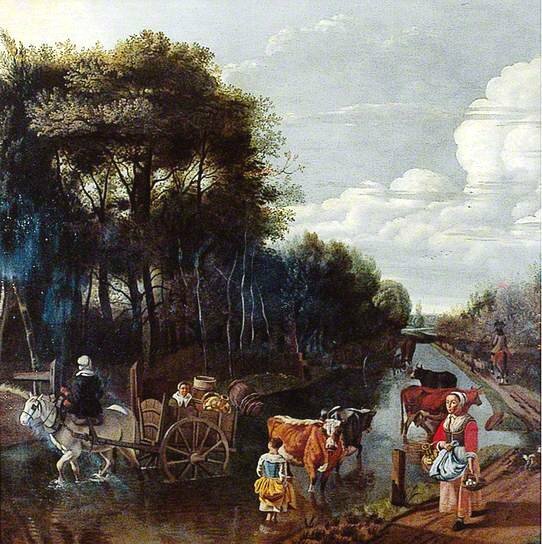 Often the countryside scenes depicted in these paintings incorporated country roads which had been partly flooded forming fords and peasant women going about their daily routine, carrying goods, such as hay or vegetables, to or from market, often by horse and cart. 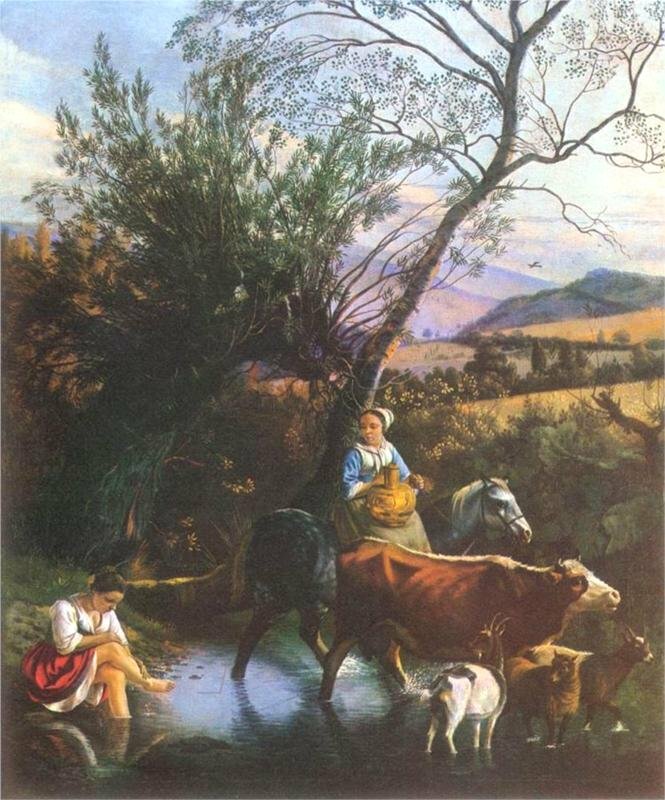 In other paintings we see the women tending to their livestock along a river bank. In Siberechts’ countryside depictions his female figures were much larger than corresponding figures in most paintings of this genre. The female figures we see in Siberechts’ paintings are not willowy, weak women but strong robust females who were quite able to hold their own against their men-folk when it came to working on the farm. The presence of water in Siberechts’ scenes gave him the chance to show off his artistic ability of depicting reflections on the water surface and the glittering of the light on moving water. 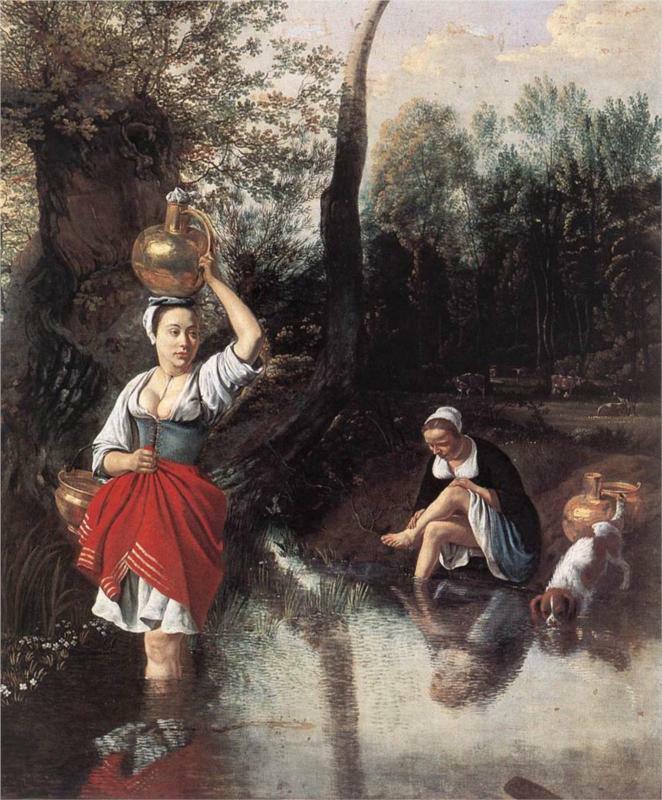 The inclusion of water into his peasant scenes also gave Siberechts an excuse for showing us a sensual glimpse of bare female thighs as they washed and cooled down their bare legs in the fords or streams. The colours Siberechts used in these landscape works were often quite similar. 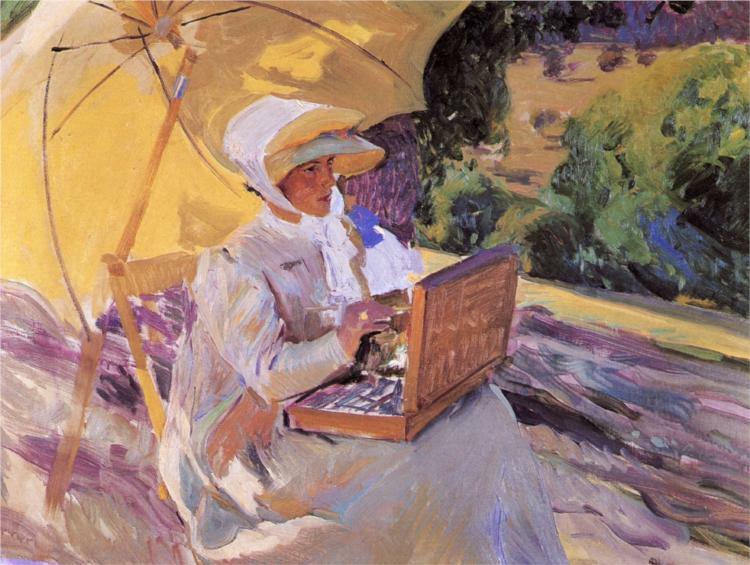 He would utilise whites, reds and yellows for the clothes of the women and these colours would contrast against the various greens he used to depict surrounding plants and vegetation. Often there would be no background as such to these paintings as the dense foliage in the middle ground obscured our view of any background. I like these works. There is a certain quaintness about them. As you will see in my next blog the paintings Siberecht did whilst in England couldnt be more different.